A day after this story was published, Ocasio-Cortez’s official website changed the format of the Green New Deal from a webpage to a Google Document. The version of the text that was available on her website at the time of publication has been added to this story and the text of this article referencing the Green New Deal website has been amended to reflect that. —Mint Press News Editors. The Green New Deal deliberately omits details on how to reorient the United States toward the drastic carbon emissions reductions it calls for, instead calling for a select committee in the House to devise a plan by 2020. Such language makes it sound as though industry insiders and business executives will be just a few of the many voices at the table. However, in addition to the fact that the committee will be stocked with House Democrats hand-picked by Nancy Pelosi—who has been accused of planning to “handcuff” progressive policies from Democratic representatives in the upcoming Congress—there is the fact that the Democratic Party itself remains just as beholden to corporate money as ever, aside from the small handful of soon-to-be members of Congress who rejected corporate money during the primaries. Are representatives hand-picked by the speaker of such a corporate-aligned party more likely to listen to business leaders or tribal nation representatives? 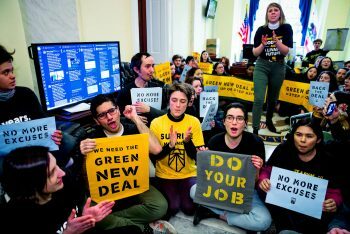 Activists occupy the office of Nancy Pelo as they try to pressure Democratic support for a sweeping agenda to fight climate change on Capitol Hill, Dec. 10, 2018. J. Scott Applewhite | AP. The majority of financing of the Plan shall be accomplished by the federal government, using a combination of the Federal Reserve, a new public bank or system of regional and specialized public banks, public venture funds and such other vehicles or structures that the select committee deems appropriate. While the language and some of the content of the plan is cause for concern, the most problematic part of the plan is the fact that it is all but guaranteed to propose a “cap and trade” system to address the issue of climate change. Notably, the plan itself does not explicitly call for “cap and trade” but does use so-called buzzwords—such as its call to “decarbonize” industry—that signal such a system will be put in place, as these terms have been used to describe past cap and trade systems. The shortest and most accurate response [to why past “cap and trade” legislation was insufficient] is that (1) none of them recognize the extent to which climate and other social and economic issues are deeply interrelated and (2) even if looking at climate as a stand-alone issue, none of them are scaled to the magnitude of the problem. 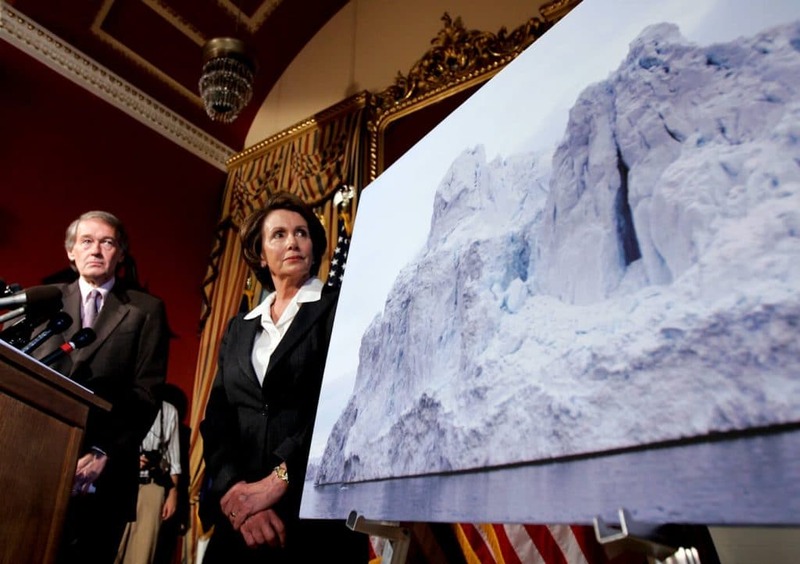 House Speaker Nancy Pelosi looks at a photo of an iceberg during a news conference on Capitol Hill in Washington, June 1, 2007, to discuss global warming. Susan Walsh | AP. Perhaps most telling of all is the fact that cap and trade has been promoted most heavily by large oil companies. Indeed, it was recently revealed by none other than Shell Oil executive David Hone—Shell being the ninth largest producer of carbon emissions globally—that his company’s lobbying efforts were largely responsible for the inclusion of a cap and trade system in Article 6 of the Paris Climate Agreement. We [Shell Oil] have had a process running for four years for the need of carbon unit trading to be part of the Paris agreement. We can take some credit for the fact that Article 6 [of the Paris agreement] is even there at all. We put together a straw proposal. Many of the elements of that straw proposal appear in the Paris agreement. We put together another straw proposal for the rulebook, and we saw some of that appear in the text. Something particularly notable about Ocasio-Cortez’s “Green New Deal,” which has been repeatedly overlooked by mainstream outlets in covering the initiative, is that it is not the first such plan to be promoted in U.S. politics in recent years that aims to transform the U.S. economy to using 100 percent renewable energy in a relatively short time frame. In fact, the Green Party first created that dea l, with the very same name as the Ocasio-Cortez proposal, in 2006 and an updated version was a major component of the Green Party’s presidential campaign in 2016. …in the same ways that we paid for the 2008 bank bailout and extended quantitative easing programs, the same ways we paid for World War II and many other wars. The Federal Reserve can extend credit to power these projects and investments, new public banks can be created (as in WWII) to extend credit, and a combination of various taxation tools (including taxes on carbon and other emissions and progressive wealth taxes) can be employed. 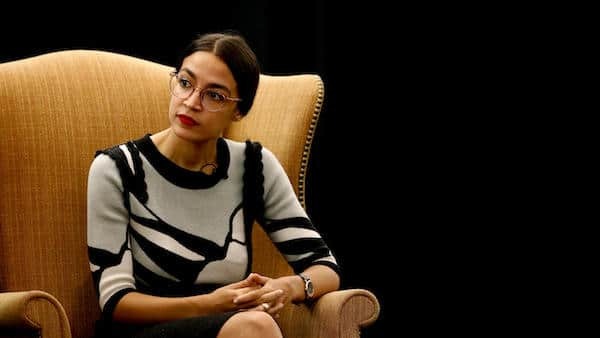 In other words, Ocasio-Cortez suggests funding the plan with credit from the private bank–and Wall Street controlled–Federal Reserve Bank, taxpayer funds, and the aforementioned cap-and-trade scheme that would enrich the country’s ruling class even more. The difference here is notable because the Ocasio-Cortez plan calls for funding her Green New Deal “the same ways we paid for World War II and many others wars” but does not call to redirect funds paying for the U.S.’ many wars abroad to fund her plan—instead calling for the U.S. government to further indebt itself through the Wall Street-controlled Federal Reserve, which her plan refers to as “traditional debt tools.” Notably, the Green Party’s Green New Deal called for nationalizing the Federal Reserve, ending taxpayer-funded banker bailouts, and breaking up the “too big to fail” banks—progressive proposals unmentioned in the Ocasio-Cortez plan of the same name. [Building] an economy based on large-scale green public works, municipalization, and workplace and community democracy … [that] rejects both the capitalist system that maintains private ownership over almost all production as well as the state-socialist system that assumes control over industries without democratic, local decision making. The Post’s take on the Stein-promoted plan was not unique, as many establishment outlets in 2016 slammed it as “deeply unrealistic” and “technically impossible,” among other derisions. Ocasio-Cortez’s version, however, has been praised by many of those same outlets as “the smartest, most practical idea in U.S. politics,” “political genius,” and “one of the most interesting—and strategic—left-wing policy interventions … in years.” Is it overly cynical to wonder what factors might account for the establishment media’s seeming about-face? Also notable was Ocasio-Cortez’s praise for war criminal John McCain, whose legacy–she claimed on Twitter in August–“represents an unparalleled example of human decency and American service,” despite his promotion of terrorism in Syria, the invasion of Iraq, and violent regime change in Libya among other grotesque examples of American military aggression abroad. Indeed, recent efforts have been launched–Ocasio-Cortez’s Green New Deal and Bernie Sander’s Yemen War Bill among them–to promote the Democrats as the anti-war, pro-environment answer to Trump, despite the fact that these very efforts, behind the spin, do little if anything to address these problems at all. Both initiatives are safely inside in the realm of the “Washington consensus” and would strengthen–not lessen–the grip of the oligarchy and powerful monied interests on the American political system. However, they would certainly give the Democratic Party talking points in the lead-up to 2020 with the case for Russian collusion yet to materialize. Despite its pretty, progressive-sounding banner, Ocasio-Cortez’ Green New Deal—in its current form—will continue to perpetuate gross distributive injustice by ensuring that the side with the most “green” keeps winning as the world continues to seek solutions to climate change.